Gene Wilder, the legendary actor beloved for his roles in Willy Wonka And The Chocolate Factory and many Mel Brooks comedies, died at his home in Stamford, Connecticut late last night, according to The Associated Press. The news was confirmed by Wilder’s family, with his nephew saying that Wilder died as a result of complications from Alzheimer’s Disease. He was 83. He was 83 and passed holding our hands with the same tenderness and love he exhibited as long as I can remember. As our hands clutched and he performed one last breath the music speaker, which was set to random, began to blare out one of his favorites: Ella Fitzgerald. There is a picture of he and Ella meeting at a London Bistro some years ago that are among each [of our] cherished possessions. She was singing “Somewhere Over The Rainbow” as he was taken away. Wilder (né Jerome Silberman) was born in Milwaukee in 1933, to an immigrant Russian Jewish family. His father manufactured miniature liquor bottles. He soon fled the Midwest for Broadway, making a name for himself in prominent shows like One Flew Over the Cuckoo’s Nest. He didn’t make his film debut until the age of 34, as a bizarre undertaker abducted by the young gangsters in Warren Beatty’s 1967 classic Bonnie And Clyde. He made a huge impact with the small part, though, and soon began his most famous enterprise as a member of Mel Brooks’ stock company of performers (Wilder had been cast with Brooks’ future wife Anne Bancroft on Broadway in 1963, leading to the fruitful introduction). The Producers also came out in ’67, kicking off Wilder’s perfect Brooks partnership, which he followed up in legendary roles like the titular doctor in Young Frankenstein and Jim in Blazing Saddles. The partnership would earn Wilder an Academy Award nomination for Best Supporting Actor for The Producers, as well as a Best Adapted Screenplay nomination for Wilder and Brooks for Young Frankenstein. 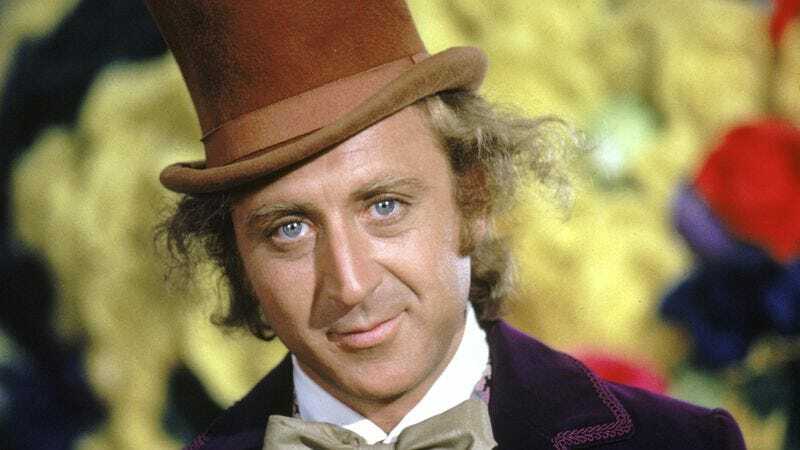 But his most legendary role may have been as Willy Wonka in 1971’s Willy Wonka And The Chocolate Factory, in a fearless performance as the enigmatic candy creator. By the mid-’70s, Wilder had embarked on another beneficial partnership, making four action comedies with Richard Pryor. In many of these movies, Wilder was an innocent man accused of a crime he didn’t commit, enabling his barely contained mania to erupt in various creative ways, in a case where two exceedingly energetic performers played well against each other. Later movies tried to craft Wilder as a romantic hero—mostly with less successful results—in efforts like The Lady In Red, and Funny About Love, based on a Bob Green Tribune column. At least in 1982’s Hanky Panky, Wilder was paired with Saturday Night Live legend Gilda Radner, who subsequently became his third wife. Following her death in 1989 after a long bout with cancer, Wilder then co-founded Gilda’s Club, a national nonprofit organization that offers support to cancer patients and their family members. After an unsuccessful ’90s sitcom, Something Wilder, Wilder had his own bout with cancer in 2000, and survived. He then stayed primarily offscreen, appearing only in a few episodes of Will & Grace in 2002-03. His last screen appearance was—appropriately enough—on the surreal kids’ show, Yo Gabba Gabba. For a performer with only 37 entries on his IMDB page, it’s remarkable that at least half of these can be considered nothing less than legendary. Unsurprisingly, as news of his death began to circulate, Twitter was soon flooded with remembrances by his fellow performers and countless fans.